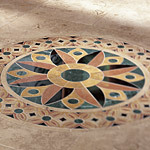 Ceramic and stone require more sophisticated flooring installation skills than most others. In addition, the permanent nature of tile and the difficulty of removing it after it has installed, make it vital to use a quality installer (like the excellent Classic Carpet & Flooring crews). Tiles and stone are joined together by grout, a finely mixed cement. Your plywood subfloor will be coated with an adhesive, a cement backer board, and more adhesive between the backer board and the actual tile. All of that support beneath the tile and stone is necessary because this type of flooring is not flexible, and it will crack if not properly installed over a tough, strong base. Installation over a concrete subfloor is less complicated and does not require the backer board. Ceramic tile and stone flooring make a dramatic statement for any residential or commercial flooring project. Customers are drawn to ceramic tile because of its lasting beauty and easy maintenance. Ceramic tile floors are virtually everlasting. Basic mopping or vacuuming is all that is required to take care of ceramic floors. Ceramic tile and stone can make a dramatic statement in a variety of rooms of a house. Ceramic tile and stone are located on the upper end of the pricelist for flooring selections, but a homeowner definitely gets what they pay for in both ceramic and stone. Installed properly, ceramic and stone floors are one of the most durable of all flooring and should last as long as the consumer wants it to. Ceramic tile can be one of the most versatile floors for design. You can mix colors, sizes, and even angles to create a truly custom look. Deco pieces and boarders can be added in to the mix to showcase a dining room table or an entryway. Porcelain and stone kitchen backsplashes are becoming more popular. Glass decos and rope boarders can help create the kitchen of your dreams.